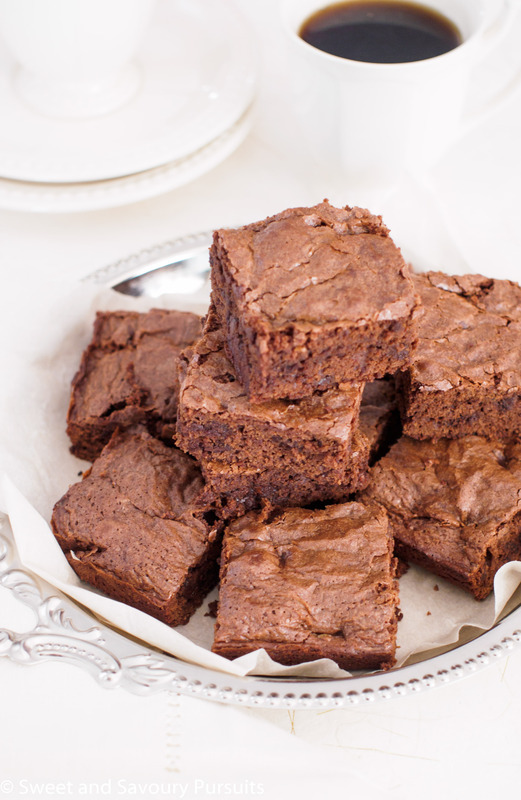 These Triple Chocolate Brownies are not overly sweet and have a wonderful chewy texture. Delicious served warm with a scoop of ice cream! 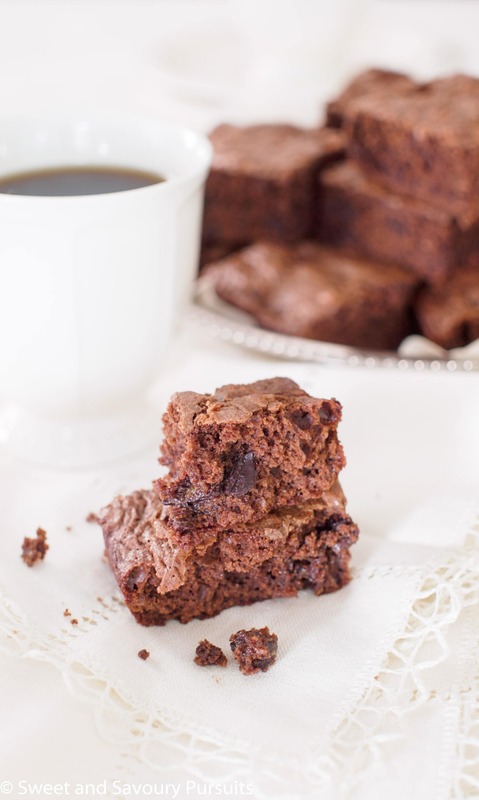 This Triple Chocolate Brownie recipe is for all of the chocolate addicts out there. If you are looking for something to satisfy your chocolate craving then I recommend a batch of these brownies! These brownies are a cross between a chewy and a cakey brownie and have an intense chocolate flavour. I made these brownies using a combination of melted semi-sweet chocolate, cocoa and semi-sweet chocolate pieces. 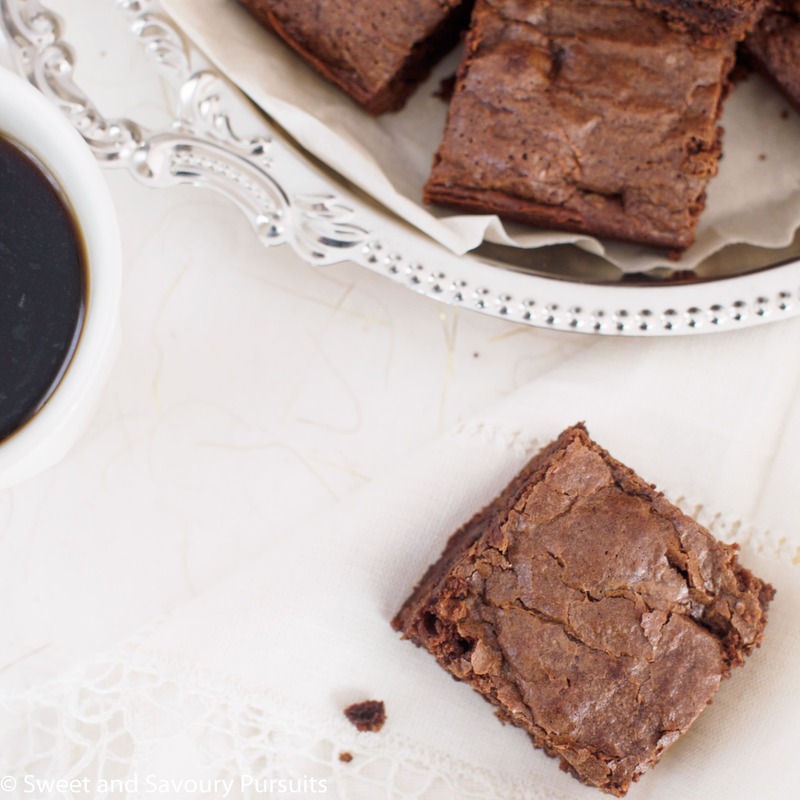 Adding just a touch of espresso deepens and enhances the flavour of the chocolate without imparting a coffee flavour to the brownies. These Triple Chocolate Brownies are not overly sweet, are light, have a wonderful chewy texture and are quick and easy to make. They would also be delicious with 1/2 a cup of chopped walnuts or nut of your choice. They are delicious served warm with a scoop of ice cream or with a nice hot cup of coffee. Grease the bottom and sides of a 9-inch square pan or line with parchment paper. In a small saucepan heat about 1 to 2 inches of water over medium heat. Place a heat resistant bowl over pot of simmering water. Put the butter and 4 ounces of chopped chocolate in the bowl. Stir the butter and chocolate until they melt, then whisk until smooth. Set aside to cool for a few minutes. To the melted chocolate, add the sugars, dissolved espresso, vanilla extract and eggs. Stir until it’s all well mixed. Add the flour, cocoa, baking powder and salt. Stir until combined and there are no traces of flour. Add in the last 1/2 cup of chopped chocolate, stir and pour into the baking dish. Bake in the oven for 18 to 22 minutes, or until a toothpick inserted in the centre comes out with a few crumbs. Let the brownies cool then slice with a sharp knife into 16 pieces. If you prefer a chewier brownie then I would recommend you don’t bake the brownies for more than 18 minutes before checking for doneness. I agree, it’s hard to go wrong with triple chocolate anything really 🙂 Thanks! 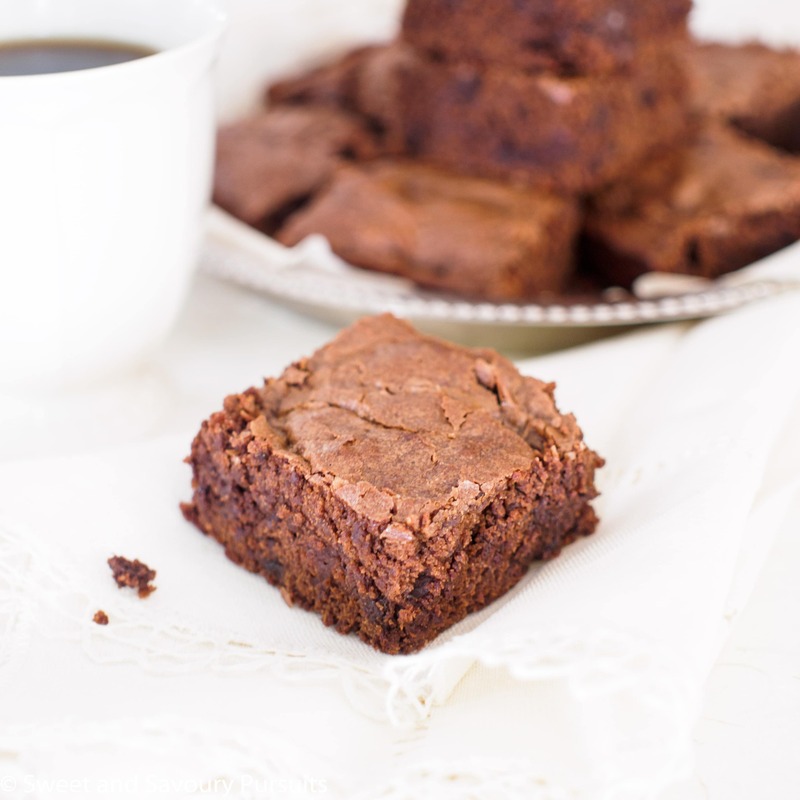 I love brownies with a nice long warm cup of milk…yum!